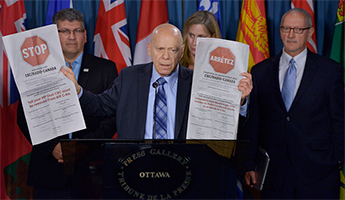 CJFE President Arnold Amber speaks at a press conference in Ottawa. May 27, 2013. Before diving into the work of the coming year, we wanted to take a moment and reflect back on some of the major free expression issues and events of 2013. From the Snowden leaks to the TPP negotiations, Bill C-461 to the silencing of Canadian scientists, and with countless attacks on journalists and protesters around the world, it was an important and challenging year for free expression. And with more staff, interns and volunteers than ever before, 2013 also resulted in some pretty incredible work from CJFE (if we do say so ourselves). Scroll through the timeline below for some highlights from the previous year, and we hope you’ll continue to support us in our work in 2014. Special thanks to CJFE volunteer Miles Kenyon for compiling the timeline.